Rice Krispies squares have always been a hit in our home. They are easy to whip up and require no baking. They are also pretty hard to mess them up! 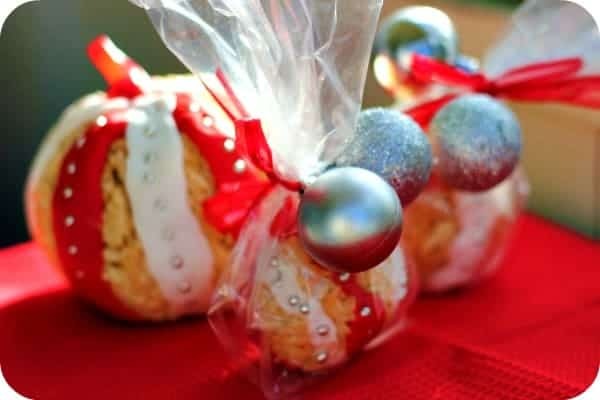 This past weekend, Bridget and I made holiday ornaments out of Kellogg’s Rice Krispies! We aren’t professionals by any means, but we had a blast making them and I think they turned out pretty darn good! 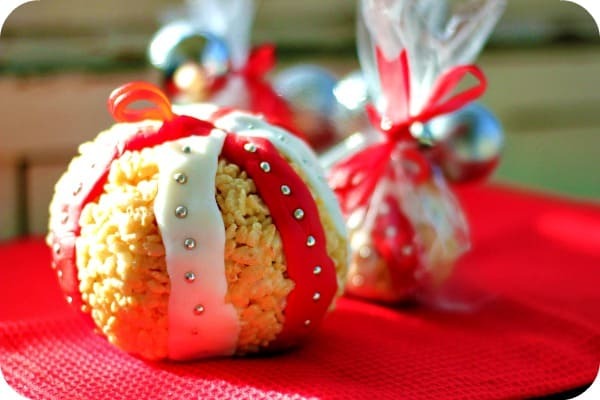 For a fun project for both adults and kids, try making these Kellogg’s Rice Krispies Holiday Ornaments. They make a wonderful edible gift! 1. In a large microwave safe bowl, heat butter and marshmallows on high for 3 minutes, stirring after 2 minutes. 2. Stir in vanilla. Stir in Rice Krispies until well coated. Allow mixture to cool slightly; form into shape. 3. Form Rice Krispies mixture into half balls, leaving space in the centre. 4. Poke a small hole in a piece of fondant with a bamboo skewer and thread with your red licorice to make the loop for hanging. 5. Place the loop inside the ball and add more Rice Krispies mixture to close the ball around the licorice so the loop sticks out; add more mixture as needed and mold with hands into ball shape. 6. Roll fondant into a sheet using a rolling pin. 7. With a ruler and pizza cutter, cut fondant into long strips; place onto ornament working your way around, cutting any excess. 8. Dip the paint brush in some water and brush onto the fondant; sprinkle on silver dragees. 5. Once complete, package the ornaments in a cello bag, add ribbon and the mini decorative bulbs. Those are very cute! I just had another idea. Cut them out with cookis cutters and decorate them. Thanks for sharing! These are awesome! And they look like something fun to make with my toddler. Maybe a new Christmas tradition? Thanks for sharing! 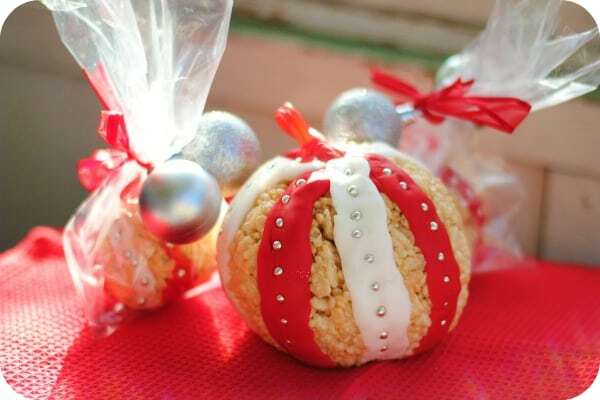 I like this idea of making ornaments out of rice krispies treats. The only problem I have is the fondant. I just can’t get it right. Maybe I can try brushing on white chocolate instead. I’ll try this tomorrow. Thanks for a great idea. Great project for the kids while on break from school. I love this idea. The ornament snacks are sooo cute and sound like fun to make. We always have a lot of rice crispies in the house. This would be cool to make and give as gifts, or bring to work, etc. Those are so cute and creative!